ETncAloseBdBLaseETaSbles 30” Wide Units! 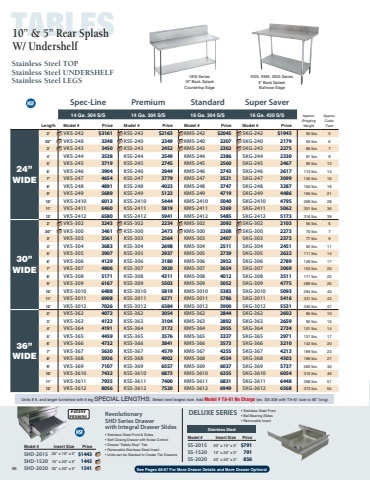 Featuring SHD Series NSF Drawers ENCLOSEd BASE TABLES wiTh dRAwERS     Heavy Duty Bolt-On Style Legs On All Enclosed Base Tables! w/ Hinged Door  w/ Sliding Doors  Model # Price    Model # Price          Hinged Doors Sliding Doors Length 60” HDRC-305 $6951   SDRC-305 $6842 72” HDRC-306 7416   SDRC-306 7295 84” HDRC-307 8915   SDRC-307 8827 96” HDRC-308 9079   SDRC-308 8918 120” HDRC-3010 11476   SDRC-3010 11385 # of # of Drawers Doors 2 2 2 4 3 4 3 4 4 4 Drawer Lock Door Lock Weight 170 lbs. 205 lbs. 245 lbs. 275 lbs. 315 lbs. 385 lbs. 425 lbs. Cubic Weight Feet 300 lbs. 55 360 lbs. 66 420 lbs. 76 540 lbs. 87 600 lbs. 107 $122 ea. 283 ea. Cu. Ft. 25 31 36 41 46 56 66    TA-105 TA-110 Length 48” 60” 72” 84” 96” 120” 144” Modified to 24” Width Modified to 36” Width ACCESSORIES $291 /table TA-14 55 /lin. ft. TA-46   diSh CABiNETS      15” WIDE Model # Weight Cu. Ft. Price 18” WIDE              Model # TA-101 TA-61 TA-56 5” NSF Option Rear Tray Lock Special Sizing Charge (From Next Larger Size) Price $88 /lin. ft. N/C DC-154 155 lbs. DC-155 195 lbs. DC-156 225 lbs. DC-157 265 lbs. DC-158 295 lbs. DC-1510 360 lbs. DC-1512 400 lbs. Model # 21 $2689 DC-184 27 2874 DC-185 32 3196 DC-186 37 3331 DC-187 42 3578 DC-188 52 4392 DC-1810 62 4523 DC-1812 Price $2870 3104 3801 4103 4412 4992 5127 Cu. Ft. 37 45 54 63 71 76 88 96          30” Wide Units! Includes K-60 Splash Mounted Faucet Model BEV-30-72L Shown BEvERAgE TABLES Length Model # Price 10’ BEV-30-120LorR* 12451 12’ BEV-30-144LorR* 12607 Weight 230 lbs. 250 lbs. 270 lbs. 290 lbs. 330 lbs. 360 lbs. 380 lbs. 430 lbs. 4’ BEV-30-48LorR* 5’ BEV-30-60LorR* 6’ BEV-30-72LorR* 7’ BEV-30-84LorR* 8’ BEV-30-96LorR* 9’ BEV-30-108LorR* 12407 $6012 6384 6787 7770 8262    Specify Sink Left Or Right End: *Please Designate Left Or Right Sink Location By Using L Or R After Model Number When Ordering. Sink Size 14” x 16” x 12” Call For Installation of Buyout Equipment! Customize Your Own Beverage Table with Additional Accessories on Pages 55-62   TA-45 Optional Glass Rack Slide $560     46 WARNING: Equipment that includes a faucet may expose you to chemicals, including lead, that are known to the State of California to cause cancer or birth defects or other reproductive harm. For more Info.,visit www.p65warnings.ca.gov.